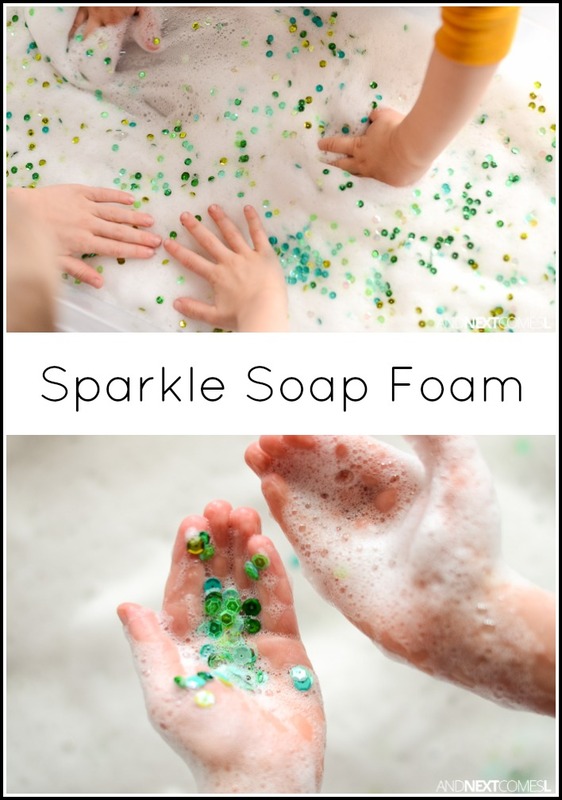 When we need a quick and easy sensory activity for my kids, we always end up playing with soap foam. My kids just love the texture of it (so do I!) and it's really versatile. 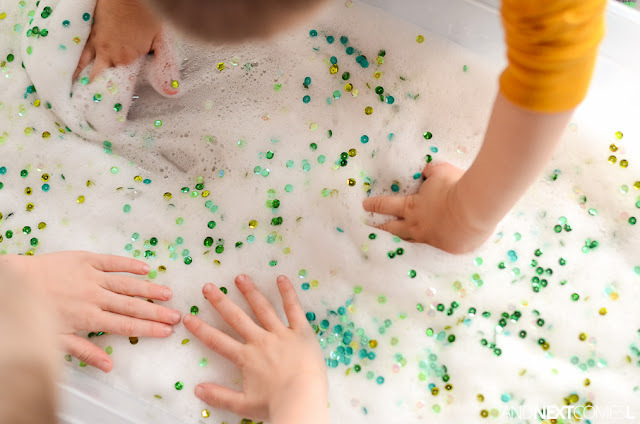 You can add all sorts of things to it, such as colors, scents, glitter, or other objects, to make an endless range of sensory bins. Since St. Patrick's Day was quickly approaching, I put together a St. Patrick's Day inspired sensory bin for the kids using green "sparkles" in the soap foam. However, it isn't specifically a St. Patrick's Day activity, simply because you could make the sparkles any color you wanted. We just chose green to go with the holiday. 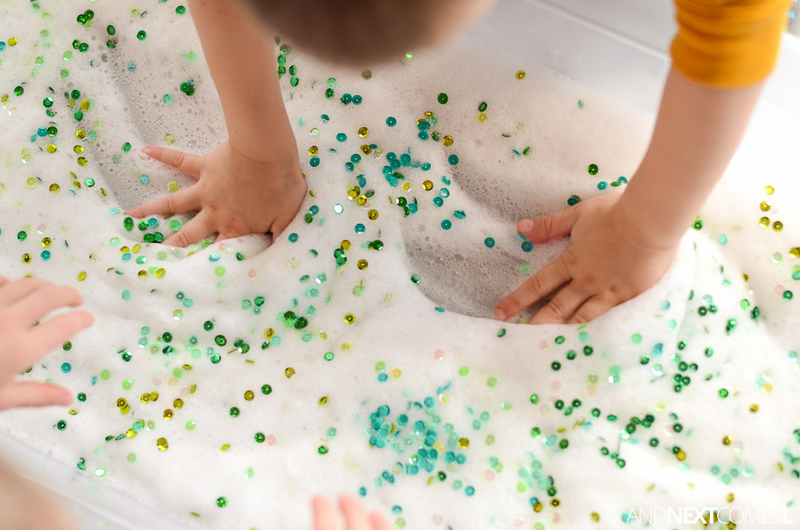 Regardless, kids will love swirling their hands through this sparkle soap foam sensory bin. 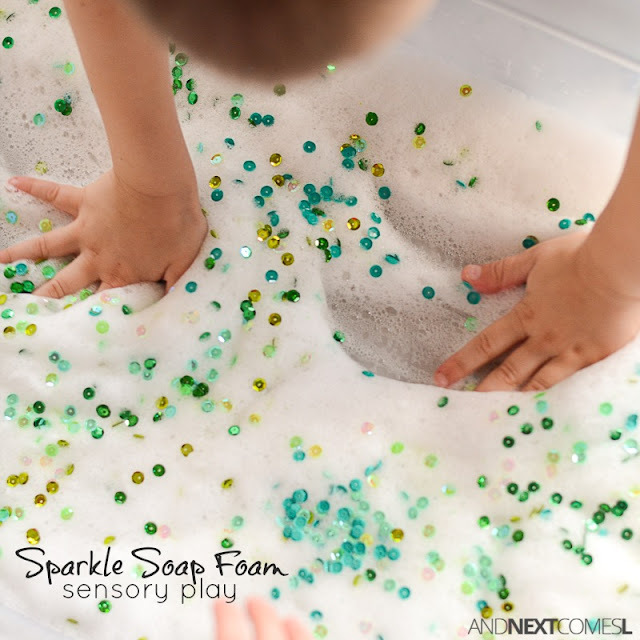 Easy Sensory Bin for Kids: Make Sparkle Soap Foam! 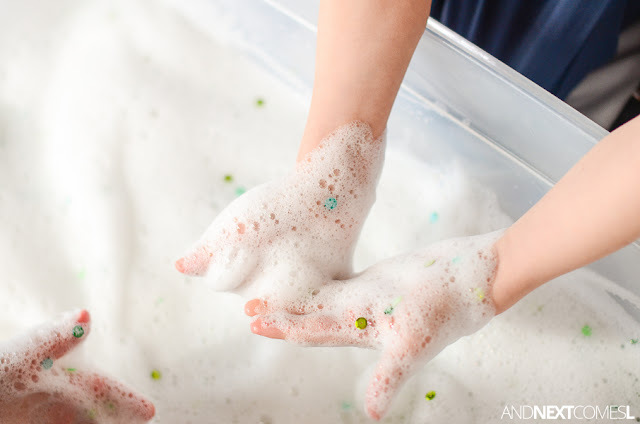 Soap foam - Mix a splash of water with liquid soap until you get a big bin of bubbles. 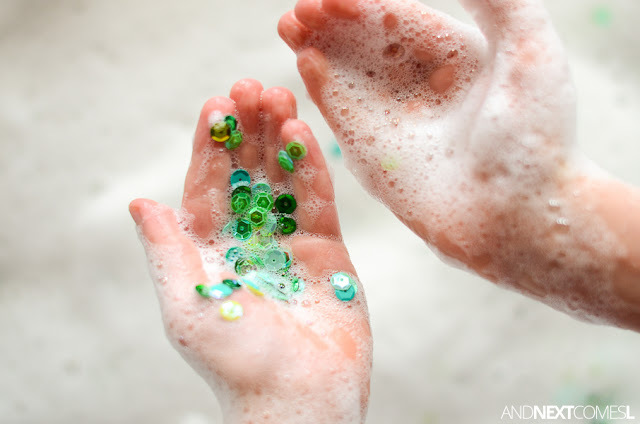 We prefer to use castile soap when making our soap foam sensory bins. 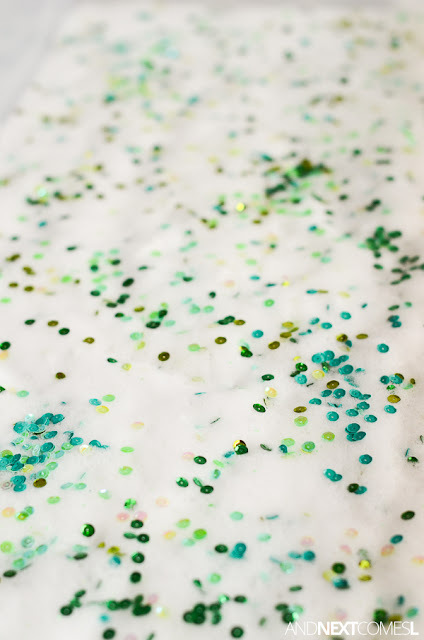 Sequins - I picked these up at Dollar Tree and we chose green to make this a St. Patrick's Day sensory bin. Once your bin is filled with lots and lots of frothy soap bubbles, scatter the sequins throughout. It's so sparkly and gorgeous! Naturally, the kids couldn't wait to dive in and swirl the bubbles around and around. 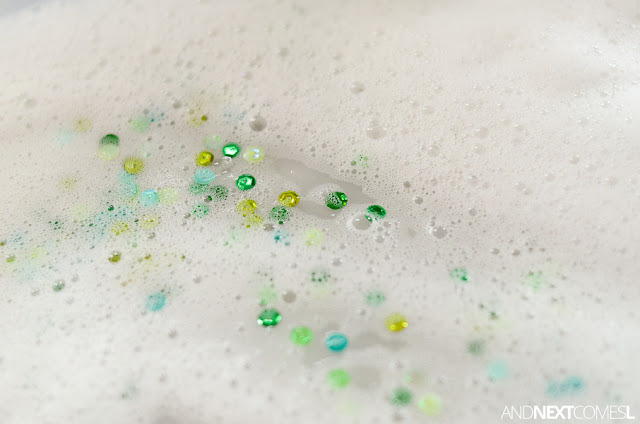 The addition of the sequins gave the soap foam a neat texture. The boys started scooping for the sequins since after awhile, they get buried underneath the soap. It isn't that easy to pick up the sequins! But it is certainly a good fine motor challenge for the kids. 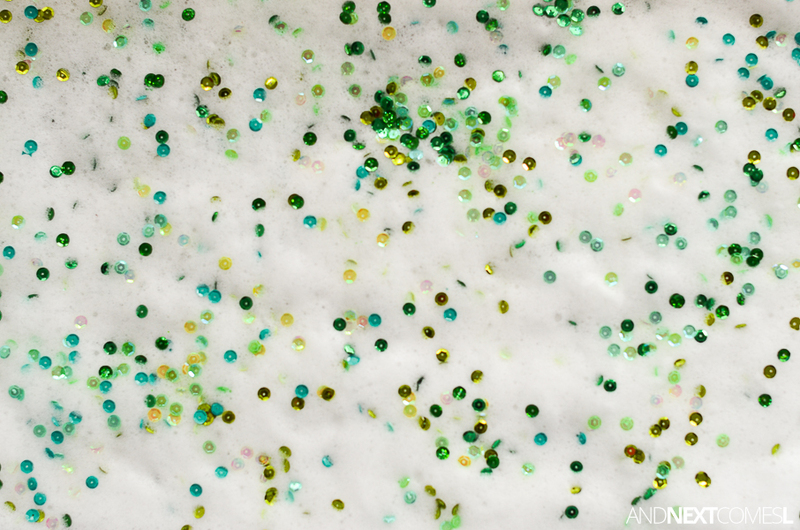 See how the sequins hide under the soap? And sometimes you can find a sweet spot in the sensory bin to scoop up a big handful of sequins!